We are located right here in Central Iowa at 10546 Justin Drive in Urbandale, just southwest of Homemakers Furniture. It's easy access to get to our office...from I80/35 take the Douglas exit. Head east on Douglas, then go south on 104th and right on Justin. We are located on the south side of the road. Feel free to give us a call at 515-243-4289 if you have any questions! 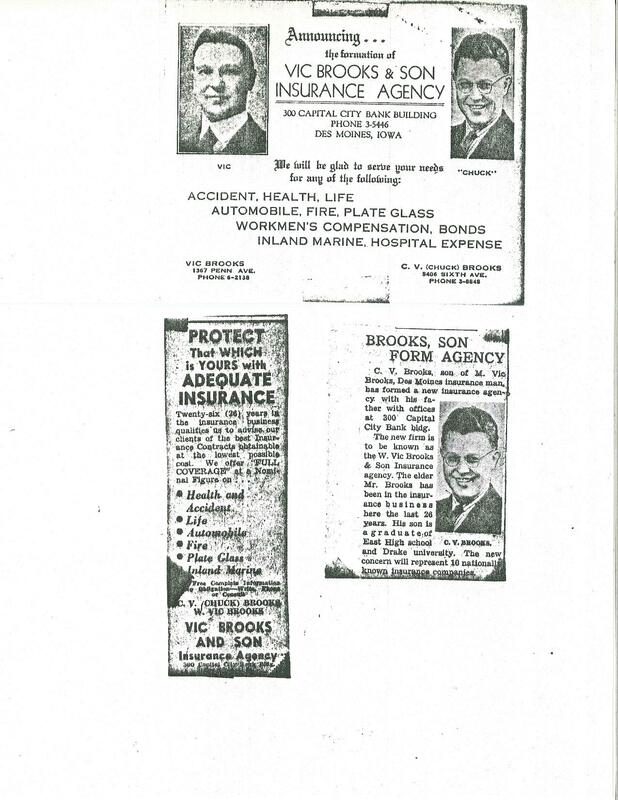 Chuck Brooks and his father Vic Brooks established an independent insurance agency in 1939. 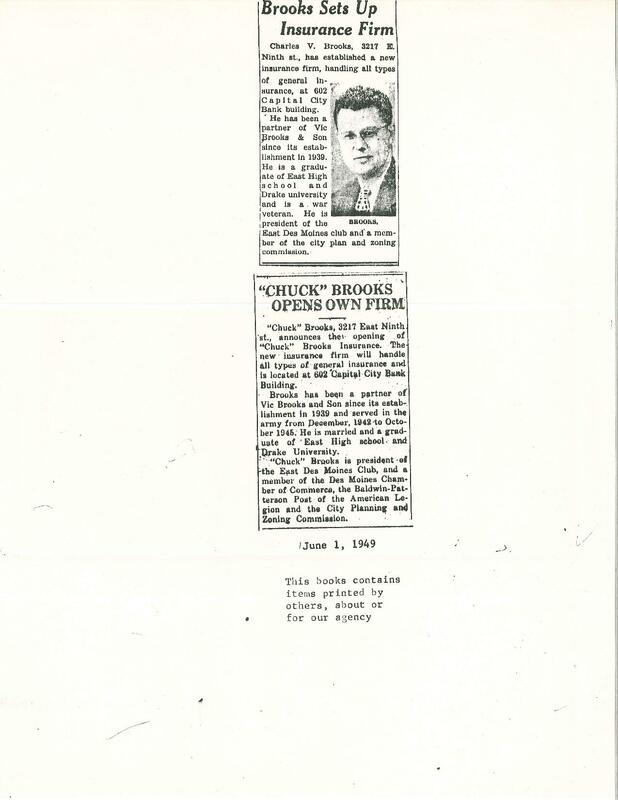 While the elder Brooks sold health insurance for the Craftsman Insurance Company as early as 1913 from his home, no established office was created until 1939. The office was located on the third floor of the Capital City State Bank Building on the corner of East 5th and Locust Streets in Des Moines. 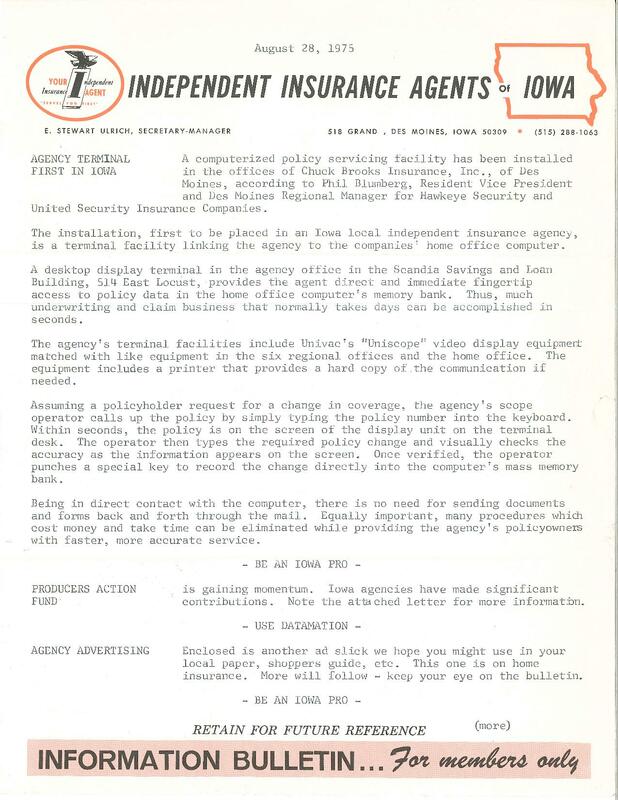 The agency was known as “Vic Brooks & Son Insurance Agency”. Chuck served in World War II for about 3 years returning in 1945 to again join the agency with his father and brother Bob. 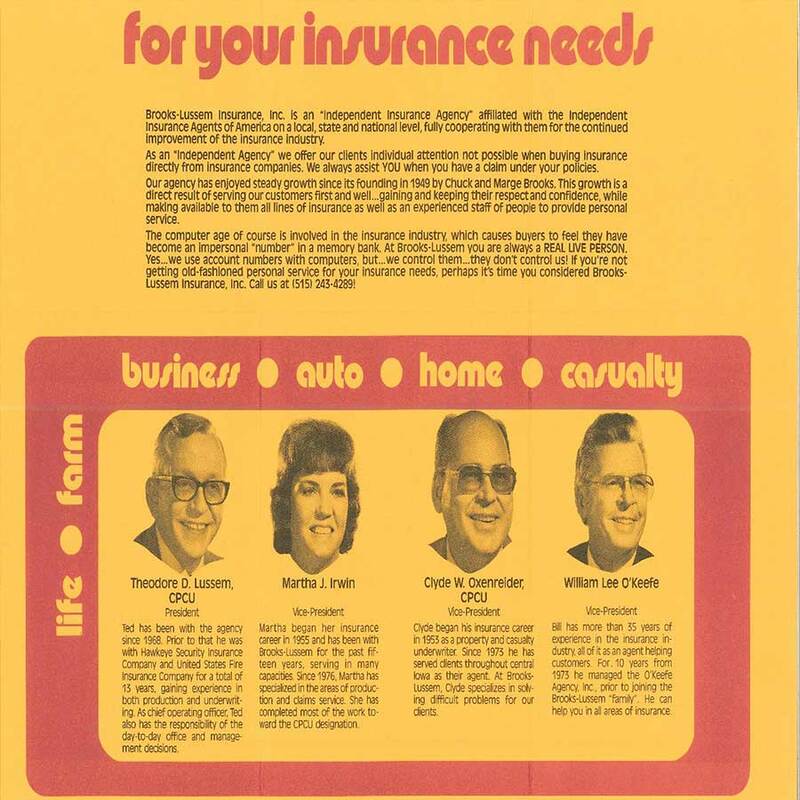 In 1949, Chuck set out to on his own, and with his wife Marjorie, formed “Chuck Brooks Insurance”. His new office was also in the Capital City State Bank building until 1964. In that year he moved to the 2nd floor of the Scandia Savings and Loan Building, that had just been totally remodeled, at 514 East Locust. 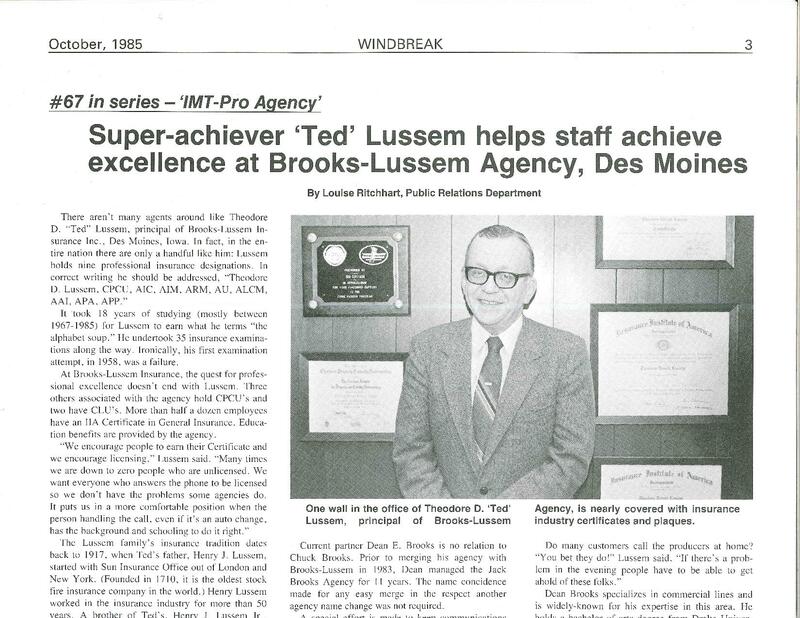 In 1968, Ted Lussem joined the agency as a minority stockholder. Ted had started in the business in 1955 and had worked for Crum & Forster for a couple of years and then Hawkeye-Security Insurance for a little over 10 years. 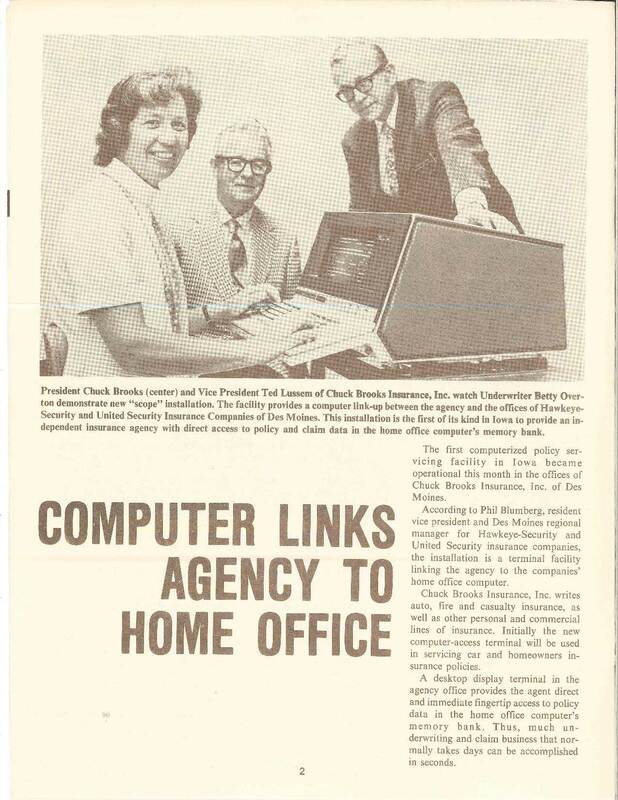 In August of 1975, Chuck Brooks Insurance became the first computerized policy servicing facility in Iowa. The installation was the first of its kind in Iowa to provide an independent insurance agency with direct access to policy and claim data in the home office computer's memory bank. 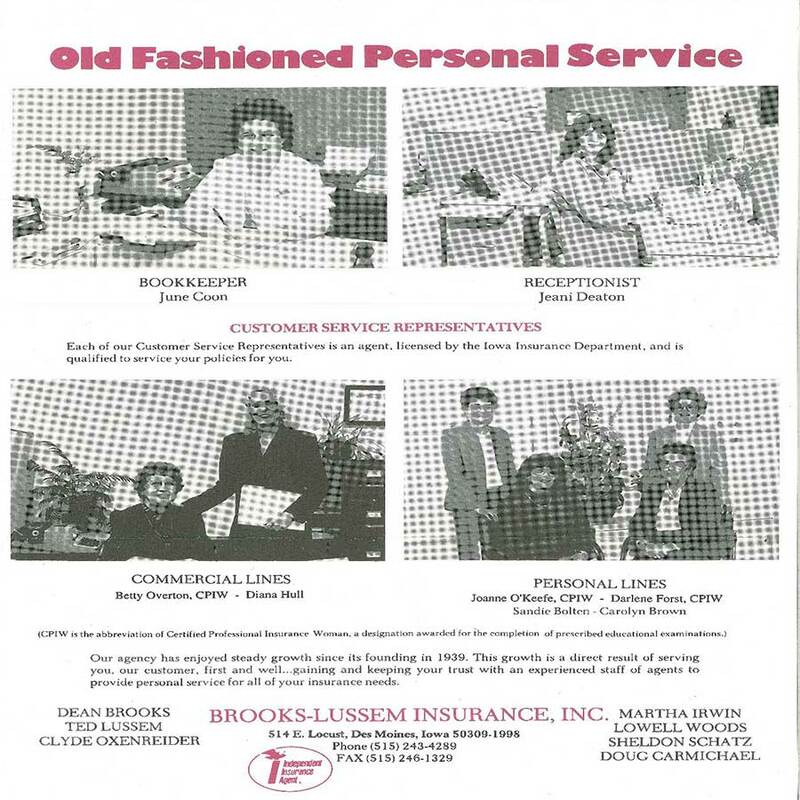 In 1979, Ted acquired the balance of stock of the agency and the name was changed to Brooks-Lussem Insurance at that time. 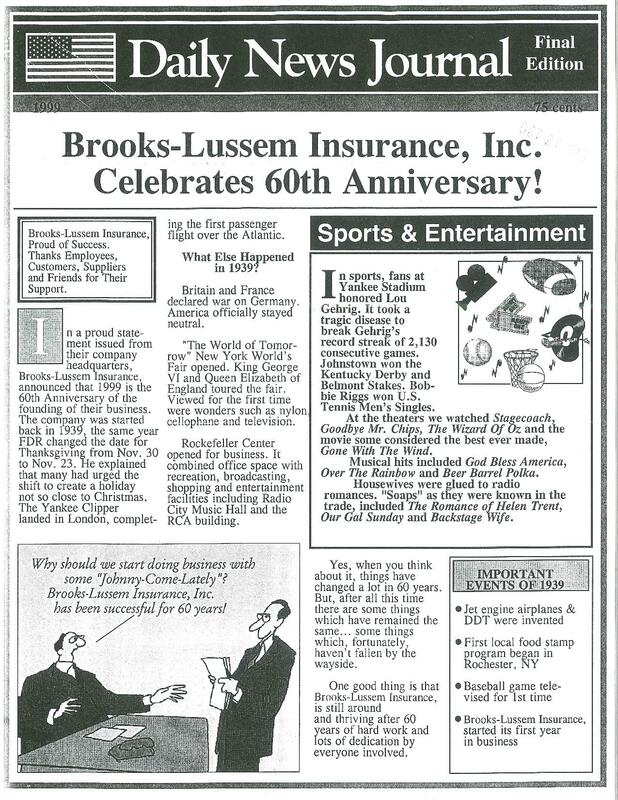 The 1980s and 90s were a growth time with the acquisition of over 15 agencies that were merged into Brooks-Lussem Insurance. 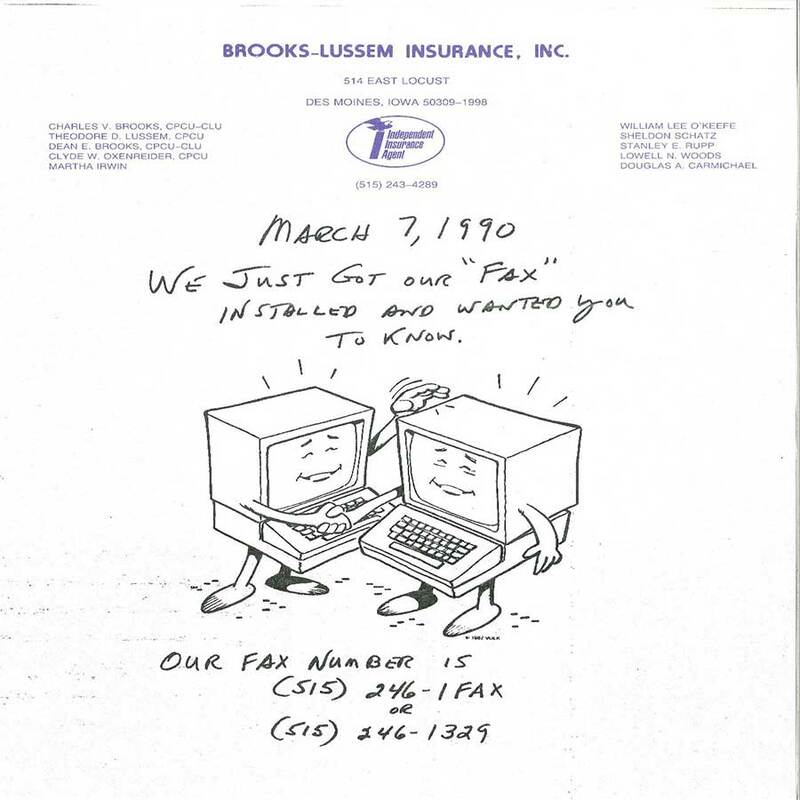 On, March 7,1990, Brooks-Lussem Insurance became one of the first agencies to incorporate a fax machine system into their office..Therefore, the fax number is (515) 246-1329 or (515) 246-1FAX because of being the first agency to incoproate the fax machine. By the year 1998, Ted knew that he had to have a plan for perpetuation of the firm. He did not want it to be swallowed up by the host of other agencies in Des Moines. Effective January 1, 2000, he sold the agency to Brian and Marla Cole. In that same year Tony Clem established the Clem Insurance Services agency in Ames, Iowa after working for Progressive Insurance for several years. On February 1, 2003, Brian moved the agency for the first time from the east side of Des Moines. The new location would be 10546 Justin Drive in Des Moines, Iowa. In March of 2006, Tony Clem acquired Brooks-Lussem Insurance purchasing it from Brian and Marla who answered a calling from their church. He continued to have an office in Ames. In September of that year, Tony acquired the Jim White Agency that had been on the local scene for many years.Starting in 2008, the two locations were known as Brooks-Lussem-Clem Insurance. In 2011, the Ames office was closed so that Tony’s efforts could be focused on one central location. Brooks-Lussem-Clem Insurance is now celebrating its 75th anniversary at the Des Moines location. Ted Lussem is still with the agency today and holds all twenty-one designations conferred by the Insurance Institute of America. He is also the only man to receive Certified Profession Insurance Man by the National Association of Insurance Women. Ted was inducted into the Iowa Insurance Hall of Fame in 2000 and has received numerous awards including the prestigous "Celebrating CPCU Excellence award" and the 2011 Burkhalter Award. He has served as the president of both the Independent Insurance Agents of Des Moines and the Iowa CPCU chapter.